I came across this very awesome, very large illustration by Jeff Carlisle named Another Night at the Warp Core Cafe. It features a vast amount of characters from a vast amount of franchises. I was hoping our community would rise to the challenge and help identify as many as possible! Nomad - ST:TOS "The Changeling"
Senator Padmé Amidala (Star Wars: Episode II - Attack of the Clones) - No, she's not in this version. She is visible here in an older, less populated version of Jeff Carlisle's artwork that was posted on Reddit in late July, 2018, however. Teddy Bear from AI Ted, or SuperTed? A Towel. "... the most massively useful thing an interstellar hitchhiker can have." Not the answer you're looking for? Browse other questions tagged character-identification crossovers fandom or ask your own question. Who are all of the characters in this paranormal genre poster? 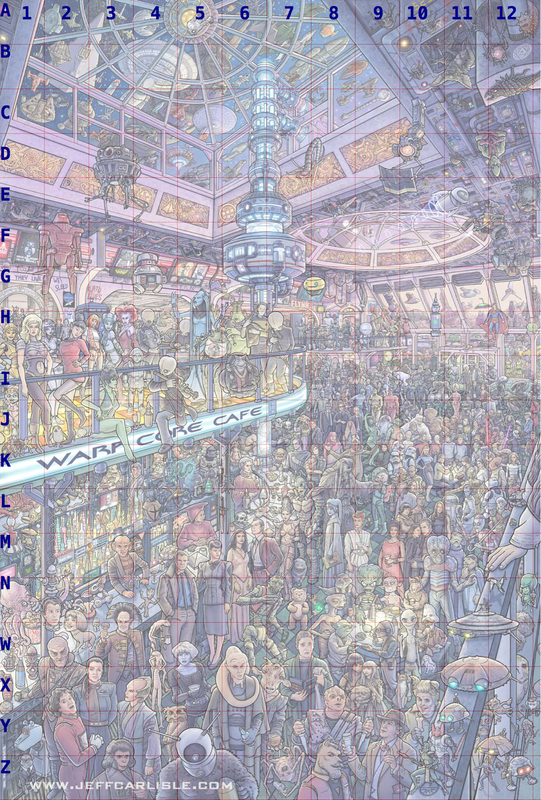 Who are the characters in the Marvel Universe Wiki background? Who are these toy elves?